Home /Blog/Whats next in US shutdown stalemate? Whats next in US shutdown stalemate? 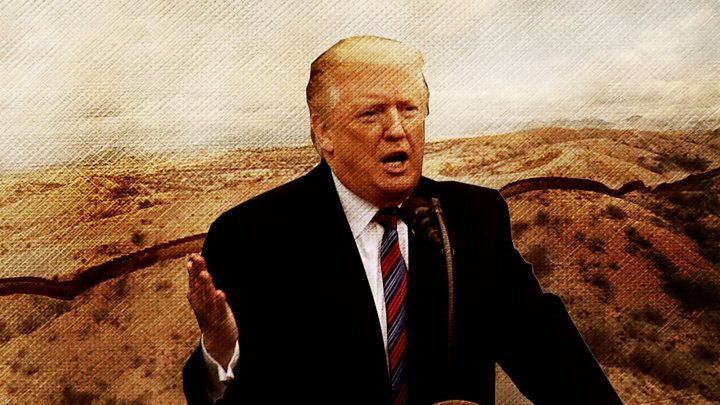 President Donald Trump has called the US-Mexico border a national security crisis while Democrats accuse him of holding America hostage over a fake threat. As a result of their standoff over funding Mr Trump’s wall, the US government has been partially shut down for 19 days. Both sides continued to dig their heels in over the issue in addresses to the nation on Tuesday night – so what happens now? As the nation waits for Washington to move forward, here are a few options open to Mr Trump, with analysis from the BBC’s Anthony Zurcher. The president’s address fell just shy of declaring a national emergency, but White House Press Secretary Sarah Sanders told reporters on Wednesday the move is “certainly still on the table”. Critics would probably consider this a flagrant misuse of power, and even after Mr Trump drafts his declaration, he must inform Congress of exactly what powers he is claiming. Congress could then void it with a vote in both the Senate and House of Representatives – but under US laws, a repeal of emergency status would still need Mr Trump’s sign-off to go into effect. In such a situation, it seems unlikely that Mr Trump would let that pass, sparking a legal battle between the two branches of government. In arguing that there is a crisis to be dealt with, Mr Trump said 300 US citizens died each week from heroin, “90% of which floods across from our southern border”. It is true nearly all US heroin comes from Mexico, but according to Mr Trump’s own Drug Enforcement Administration, most of it comes through legal ports of entry. So a wall would be ineffective. And ahead of an election year, it is unlikely the president would get complete support for such a controversial measure from his own party. Anthony Zurcher: Donald Trump is running out of leverage in his negotiations with Democrats. 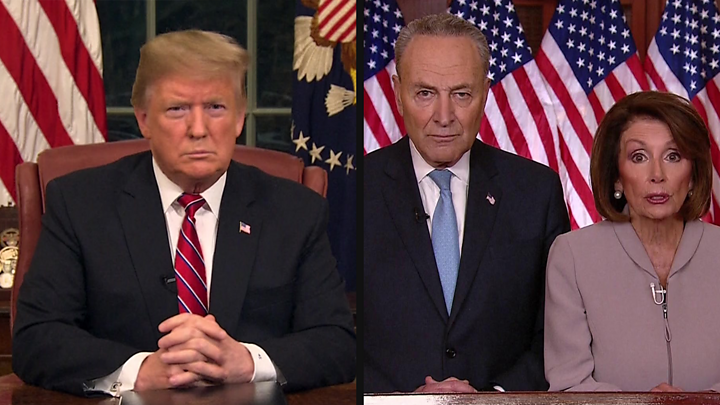 The “national emergency” threat is just about the only card he has left to play – but Tuesday night, when he could make his case before the nation, was probably his best chance to play it. While taking such a step would allow the president to claim he is taking action while moving the battle to the courts, even some conservatives fear it would set a bad precedent. Democrats may conclude he is bluffing – putting the president back at square one. Mr Trump met congressional leaders at the White House on Wednesday in another effort to resolve the shutdown, only to end up walking out when Democrats remained firm on no wall funding. Meanwhile, pressure has been mounting on Capitol Hill – as have resistance efforts. On Tuesday, Senate Democrats shot down a bipartisan Middle East policy bill in protest, and could continue to block legislation in protest at the government shutdown. “We cannot be business as usual, with the government shut down, people not getting paychecks and people getting hurt,” Democratic Senator Patty Murray of Washington told CNN after the vote. Senate Majority leader Mitch McConnell on Wednesday accused the Democrats of thwarting the president out of “spite” and a “new partisan allergy to the subject of border security”. At the same time, Democratic Representative Hakeem Jeffries, speaking to reporters after a closed House Democratic Caucus meeting, said “with each passing day”, his party expects more Republican willingness to negotiate. Mr Jeffries reiterated that House Democrats are willing to use Senate Republicans’ prior legislation to re-open the government. All nine congressional representatives (including one Republican) of the states bordering Mexico are against Mr Trump’s wall. Anthony Zurcher: As the shutdown gets worse, it’s going to be increasingly difficult for Mr Trump to keep Republicans in Congress from breaking ranks. Already there are three Republican senators on record calling for the government to be reopened without additional wall funding. When the House voted on the Democratic bill to reopen the government, seven Republicans joined them. In future votes that number is sure to grow. Members in both chambers are all going to be looking for an exit ramp in negotiations to get out of this mess. If Republicans can’t offer Democrats anything to address the situation for undocumented migrants already in the US, the most likely outcome is new, vaguely worded border security funding that doesn’t explicitly give the president money for his much-promised wall. Some 800,000 federal workers are expected to miss their first pay cheque this week if the president and lawmakers are unable to reach a compromise. Many have been furloughed – temporarily laid off – but those deemed essential have been working since 22 December without pay. And if the partial shutdown lasts through the weekend, it will become the longest government shutdown in US history. Over the last 19 days, federal employees have shared their fears of affording rent, making credit card payments and putting food on the table. Hundreds have turned to fundraising or side-jobs to make ends meet. Airport security staff, who have been working without pay, have begun leaving their jobs or are seriously considering doing so over the shutdown, according to officials. Anthony Zurcher: In the early days of the shutdown there were reports that the White House did not sufficiently consider the implications of an extended period without full government funding. The much cited 800,000 number for federal employees – most of whom are scattered across the US and not paper-pushing bureaucrats in Washington – only starts to paint the full scope of the impact. The administration is promising that tax refunds will be processed on time and federal food assistance will continue, but it seems clear the administration didn’t realise this was a possible outcome when they began. This may be a “partial” government shutdown, but the impact on the lives of Americans – and on the US economy as a whole – is significant and growing.